The Consumer Energy Alliance (CEA) recently released its third Appalachian Basin report detailing the incredible savings consumers have experienced as a result of regional shale development. The CEA report finds that lower natural gas prices – thanks to fracking – saved West Virginians almost $4.3 billion from 2006 to 2016. Combined with the CEA findings in Ohio and Pennsylvania, these reports show that the Appalachian Basin experienced more than $80 billion in savings during this time period. 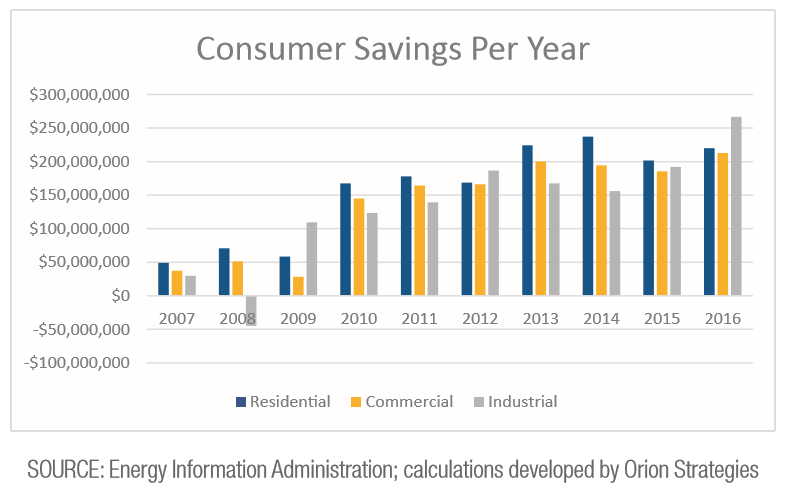 In West Virginia, the savings were nearly $1.6 billion for residential consumers and more than $2.7 billion for industrial and commercial consumers. Further, this increased production has led to record tax revenue, as West Virginia Department of Revenue Deputy Sec. Dave Hardy told Inside Shale last month. Hardy explained that “historic” July state tax revenues were $32 million over budget as a result of record West Virginia Marcellus Shale production and related activities. For a bit of perspective, the state’s budget surplus for the entire previous fiscal year was $36 million. West Virginia is a prime example of how game-changing this industry has been for the region. And as more investment dollars flow into the Appalachian Basin for shale development and related activities – the CEA report says pipeline investment in West Virginia alone has been over $16.7 billion – these benefits are only going to get better.